CUPE is also concerned about the lack of consultation throughout the process. “We are extremely disappointed that neither the Saskatchewan Health Authority (SHA) nor the consultant conducting this review of security services asked for formal input from our union members who deal daily with the health and safety of clients, patients, staff and visitors to our health facilities,” said Seitz. 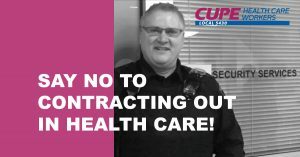 CUPE Local 5430, the union representing close to 14,000 health care workers in the province of Saskatchewan are committed to keeping health care public. “The Saskatchewan Health Authority has a legal responsibility to provide a safe and secure workplace. It should not, under any circumstances, contract out its responsibilities for safe workplaces,” added Seitz.